Create a party decoration that's sure to capture the attention of all your guests. A toilet paper cake is a humorous party table centerpiece that's suitable for different parties, such as over-the-hill birthday celebrations or pre-wedding parties. They also makes a funny gift for a friend feeling under the weather. The cake is incredibly simple to make and you can adorn the decoration with ribbons, bows or silk flowers. Place a large, round cake tray on your work surface. 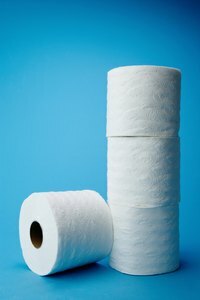 Arrange three toilet paper rolls in a circle in the center of the tray and then surround the circle with an outer circle of five toilet paper rolls. Add additional outer circles to the cake to make it larger. Wrap a wide ribbon around the outer circle of toilet paper rolls to keep the cake tier together. Tape the ribbon ends together or tie them together in a bow. Make the second tier on top of the first. Use five rolls for the second tier, with one in the center and four surrounding rolls. Wrap another wide ribbon around the outer circle and tape the ends or tie them in a bow. Place one roll of toilet paper on top and wrap a ribbon around the roll. Trim the stems of 10 silk flowers to about 3 inches in length. (You'll need more silk flowers if you made the cake larger.) Slide the stem of one flower into the exposed inner roll of any of the toilet paper rolls. This creates a decorative enhancement for the cake and hides the inner circles of the rolls.